Bill Gates is an American businessman and computer programmer. He is best known as the co-founder of Microsoft, along with Paul Allen. Microsoft is the world’s largest PC software company. He has served as chairman, CEO and chief software architect of the company, while he was the largest shareholder until 2014. Through his "Bill & Melinda Gates Foundation", he has donated money to many charitable organizations and scientific research programs. He is currently the wealthiest man on earth with a net worth of more than 80 billion american dollars. 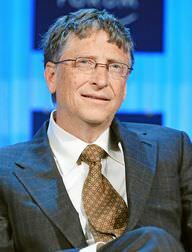 He has been married to Melinda Gates since 1994 and they have 3 children. DAVOS/SWITZERLAND, 24JAN08 - William H. Gates III, Chairman, Microsoft Corporation, USA, delivers a speech during the session 'A New Approach to Capitalism in the 21st Century' at the Annual Meeting 2008 of the World Economic Forum in Davos, Switzerland, January 24, 2008. Bill Gates was photographed by the Albuquerque, New Mexico police in 1977 after a traffic violation (details of which have been lost over time). Stills from videotape of en:Bill Gates' deposition at 1998 en:United States v. Microsoft trial. Bill Gates is a famous American businessman and computer programmer, who was born on October 28, 1955. As a person born on this date, Bill Gates is listed in our database as the 1st most popular celebrity for the day (October 28) and the 2nd most popular for the year (1955). People born on October 28 fall under the Zodiac sign of Scorpio, the Scorpion. Bill Gates is the 7th most popular Scorpio. Aside from information specific to Bill Gates' birthday, Bill Gates is the 41st most famous American. In general, Bill Gates ranks as the 67th most popular famous person, and the 2nd most popular businessman / businesswoman of all time. “The Famous Birthdays” catalogs over 25,000 famous people, everyone from actors to singers to scientists to serial killers and more. If you're curious to see who was born on your birthday, you can use our database to find out who, what, where, when and why. You can search by birthday, birthplace, claim to fame or any other information by typing in the search box, or simply browse our site by selecting the month, the day, the horoscope, or any other clickable option.